We all are aware of the fact that PHP is one of the most widely used web languages by the developers. Since it is one of the oldest web languages, it offers various features to build an awesome ecommerce experience. An ecommerce platform is one of the most important aspects of the online experience and with the global ecommerce market growing at a tremendous pace, we can see lots of new trends being implemented. When starting to build a new ecommerce website, there are lots of elements that have to be figured out, right from choosing the best platform, social media strategy, product photography and etc. It can be difficult for you to choose the best PHP ecommerce platform without knowing about the various platforms available in the market. There are many affordable and effective ecommerce solutions and here in this blog, I will discuss some of them to make your selection task as easy as possible. Though each of these platforms have their own strengths and weaknesses, it is you who has to work out to find out the right fit for your ecommerce business. Magento is an open source platform written in PHP for ecommerce development. The free version has limited features and if you want something out of the box solution, then it is better to go for the paid version. It has a consistent release cycle offering various themes, modules and extensions, so that you can easily customize your solution to suit your business. It offers one click payments, shipping to other addresses, guest checkouts and etc. It also offers a wide range of pricing and plans to suit the exclusive needs of big companies and enterprises. This is another popular ecommerce platform in PHP and is specifically designed to develop ecommerce capabilities to an existing WordPress website. Considering the popularity and easy to use WordPress platform, many business owners are choosing WooCommerce to add functions to their existing web page. This is a free plugin for WordPress, rather than a CMS like Magento. This helps you to easily add an online store and also the checkout the facility to the existing site. WooCommerce is a fantastic ecommerce platform for small business owners to change their existing website into an e-store. This is an open source platform and was originally written in Perl and then rewritten in PHP framework. It is an out of the box shopping cart that is still in an active development phase and offers about 12,000 themes and plugins among which some are free and some are paid. Unlike most open source projects, you might find a little difficult as there is not much support available, but you can opt for any paid support services. It is a PHP based, open source platform that is specially designed and developed to build highly interactive and user friendly ecommerce websites. It offers great flexibilities and features to the users. The multilingual assistance, of course makes it an ideal choice for the online store owners who are willing to spread their business across various locations. 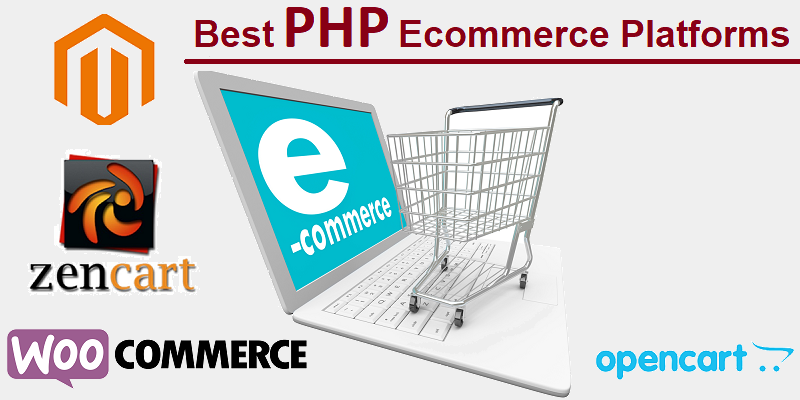 All these are the best PHP Ecommerce Platform for doing a successful Ecommerce business. you can use paid version for this software to get full features and functionalities. Magento is widely used open source platform these days, it has Magento SEO feature that is best to optimize the website in terms of duplicate content, user traffic, the design of the landing page etc.